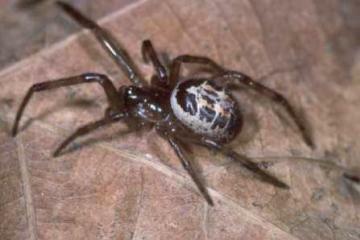 The 'noble false widow' spider Steatoda nobilis has received a lot of unjustified and inaccurate statements about its danger to humans and its spread in Britain. It was first recorded in Britain near Torquay in 1879! However it was not described from Britain until 1993, when it was known to have occurred since at least 1986 and 1989 as flourishing populations in Portsmouth (Hampshire) and Swanage (Dorset), with a population in Essex at Westcliff-on-Sea recorded in 1990, and other records from Littlehampton in West Sussex.and Worthing, where a young woman was recorded as being bitten by a female (Snazell & Jones, 1993 - Bulletin of the the British Arachnological Society Vol. 9 (5): 164-167).There is now evidence of its distribution spreading more widely as far north as Norfolk. Although Steatoda nobilis has been implicated in bites to humans, this is unlikely to happen in normal circumstances since the spiders are usually confined to their web, in cracks in walls or under window sills. Notwithstanding that the bite in most people would be little different to a bee sting, and there are currently few definite recorded occurrences in Britain since 1979, which is hardly cause for alarm. Steatoda nobilis has a distinctive pattern on its abdomen. It is closely related to the widespread and common spider of houses and outhouses Steatoda bipunctata, but this species has little pattern, with a whitish line around the front of the abdomen and sometimes a line down the middle of the abdomen. If you believe you have found Steatoda nobilis, we need the usual facts (where, when, how many) but as much other detail as possible: which plants, what habitat, activity &c. If the record is to be accepted, it would also be important to include a photograph showing the abdominal pattern or preferably an actual specimen.